By committing ourselves to the life of a bodhisattva, we vow to live as free individuals without suffering and contribute to making the world around us a better place. The Jungto Society dreams of Jungto (Pure Land), a world where individuals are happy, societies are peaceful, and nature is beautiful. The Jungto Society is a Buddhist community founded with the aim of solving problems prevalent in a modern society such as greed, poverty, conflict, and environmental degradation, based on the teachings of Buddha. 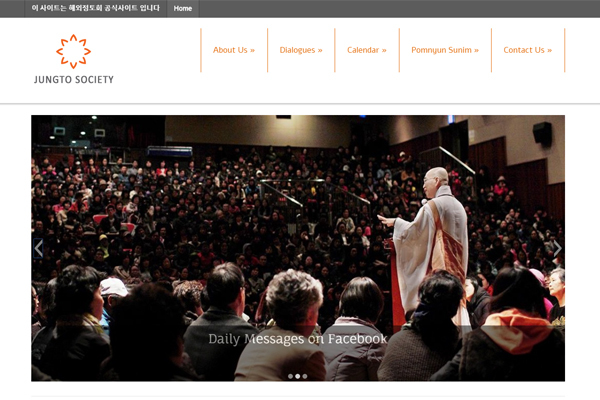 Founded in 1988, The Jungto Society has since established the Jungto Missionary Center, Jungto Monthly, the Korean Buddhist Society Research Institute, and the Korean Buddhist Society Education Center. With an emphasis on individual Buddhist practice, which transforms people’s lives, the Jungto Society has been promoting various movements such as ecological awareness campaigns; the eradication of famine, disease, and illiteracy; advocacy of peace and human rights; and the unification of the Korean Peninsula. The Jungto Society has been working to create Buddhist communities that enable their members to view the problems people face today from a global perspective and to play leading roles in solving these problems. As of November 2013, the Jungto Society has 59 regional chapters in South Korea and 20 overseas chapters including 12 in the United States. Jungto societies offer gatherings for Buddhist ceremonies, Venerable Pomnyun Sunim’s Dharma talks, and other Jungto Buddhist programs. These societies also actively promote environmental protection and the welfare of those in need, including starving North Koreans and refugees.